I think I’m turning into a helicopter mom. At night I dream about my bears, and in the mornings my first thought has been about Spruce, my furry problem child: Did he get kicked out of his den again or did he manage to defend it? 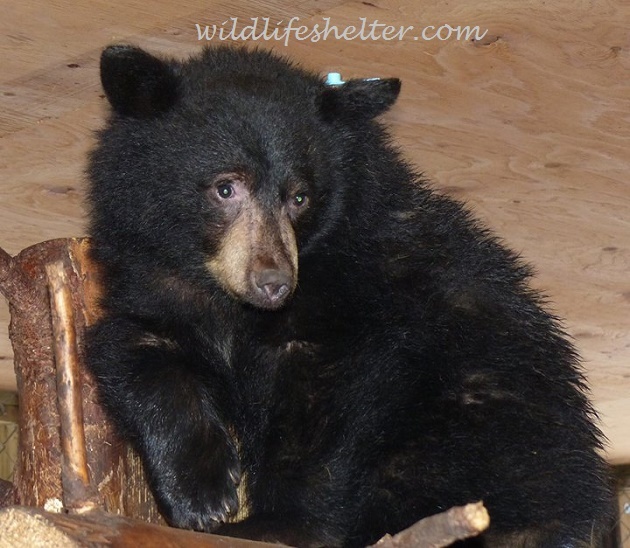 The bears are playing musical chairs with their den boxes, and Spruce is very good at losing. He looks the part, too: sad. I wish he would make friends with one of the ten other orphaned black bear cubs he shares the enclosure with. But it seems they are too busy changing boxes and booting Spruce out of his. Noel, a cub with a chip on her shoulder who has been picking fights with most of her foster siblings, apparently started it all off. Hunched over in a threatening position she started stealing food from Spruce right in front of his box. He popped his jaws and grumbled threats, but in vain. He couldn't assert himself. She ate his food, and days later squeezed into his den. Snarls and growls erupted, Noel’s fuzzy bum poked in and out of the entrance. The entire box shook with bear rage until Spruce finally managed to kick her out, spitting and hissing. In the wild, bears can move to a different spot or out of range of a more dominant bear. 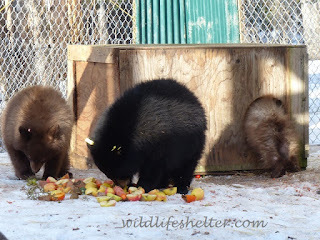 The level of interaction the orphaned cubs experience with so many other bears in the enclosures at Northern Lights Wildlife Shelter is different from how they would grow up in the wild. Yet without a mother bear to solve conflict situations for them, these fights – quite harmless because the bears are still small – give the cubs a chance to learn how to look after themselves. It does come with one drawback. Survival rates after release back into the wild are slightly better for rehabilitated bear cubs than for cubs raised by their bear mothers. But while cubs raised by their mothers in the wild often die due to human impact, rehabbed bears tend to fall prey to other bears and cougars – having had little chance to learn predator avoidance because of their time in human care. How will Spruce fare once he is released in June? I’m not too sure. The day after he managed to evict Noel from his box, he finds himself booted out by three other bears. With temperatures dipping into the -20s at night and a mean wind chill, I don’t want him huddled on the climbing platform for days and nights on end. True, he is a wild animal and he does have protective fur, but his options of finding a comfy sleeping place are limited by the fence around the enclosure. I end up setting up a box for him in a different part of the enclosure. Making a bear understand where I want him to establish his safe spot isn’t all that hard. I place his food right in the box entrance where he can see and smell it from the climbing platform. The next step is to rob him of the illusion that the platform is his safe spot: I chase him down with a long-handled rake – and he scoots into the box where the food is. Success doesn’t come that easy, though. Other bears kick him out again, and I have to repeat the procedure three more times until he finally manages to establish himself in it. I feel like a parent with a shy, nerdy child that needs extra support to succeed in life. This little bit I can do, but the rest is all up to him.